Two mystical adventures of hidden objects and match-3 puzzles! Collect coins and gems as you boldly navigate these unique, hybrid seek-and-finds. Journey far from home to unearth precious jewel boards and collect powerful relics! Includes: "Jewel Quest Mysteries Curse of the Emerald Tear" and "Jewel Quest Mysteries: Trail of the Midnight Heart"
"Jewel Quest Mysteries Curse of the Emerald Tear" - In Jewel Quest Mysteries, Rupert and Emma are plunged into the land of ancient intrigue, Egypt. Seek out treasures and jewels, hidden within stunning gardens and relic-laden palaces. 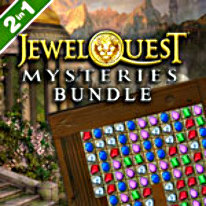 Swap jewels to turn tiles gold in classic Jewel Quest boards, and decipher puzzles of logic and wit. A hidden object game shrouded in the lore of Jewel Quest and the mystique of ancient Egypt. "Jewel Quest Mysteries: Trail of the Midnight Heart"-After answering her uncle's call, Eva Witheby winds up far from home and amidst strangers in Jewel Quest Mysteries Trail of the Midnight Heart. It's hard to know who to trust when treacherous trails and veiled secrets abound. Alongside Eva, uncover relics in eye catching hidden object screens. Unearth tools that will help you reveal shards of the precious jewel boards and discover all new scrolling search screens that put you in the front seat of whizzing planes and a whirlwind adventure. Jewel Quest Mysteries 2 is a hidden object adventure like no other!